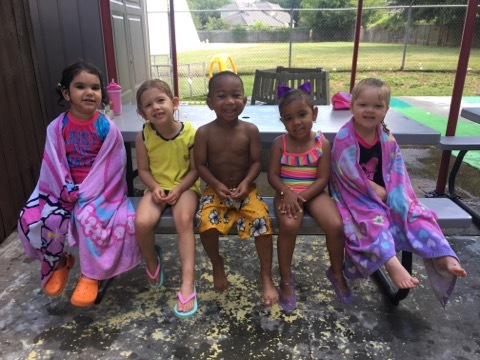 At Kid Scholars Academy, we recognize that toddlers need many opportunities to physically explore their world inside the classroom and on the playground. In the toddler room, we begin more structured activities, such as learning centers and circle time. Your toddler will begin learning concepts of color and size, and will build their vocabulary. Our staff understands the challenges that toddlers face in a social learning setting, and have experience in helping them adjust to the schedule and routines of the classroom environment. Our food menu features breakfast, lunch, an afternoon snack, & dinner! We have 3 different menus that we cycle through every 3 weeks! We make sure your child is fed a healthy and diverse diet ensuring they never go hungry or thirsty. All children will be offered portable drinking water throughout the day, and will be available upon their request. If you would like to see the menus please just email us or call (281) 436-9588, and we would be happy to send them over. If you have special food requests we are sure that we can accommodate.